One of the most widely believed facts about the Indian e-commerce story is that Flipkart.com’s 2010 decision to start offering “Cash on Delivery” (COD)—a payment option that allows buyers to pay for goods at the time of receipt—catalysed the entire sector and set the stage for fantastic growth rates thereafter. “There is a massive amount of hype that COD, as defined by Flipkart, has redefined e-commerce in India. It is absolute nonsense,” says K Vaitheeswaran, founder and CEO of Indiaplaza. Vaitheeswaran introduced COD at Indiaplaza back in 2001, when it used to be called Fabmart.com, only to withdraw the option by 2003. Courier companies who delivered his orders kept COD money for two-four weeks, putting substantial pressure on the fledgling startup’s cash flows. Worse, many of Vaitheeswaran’s customers told him they found COD more cumbersome than prepaid orders (via credit or debit card) because someone had to be physically present at the time of delivery with cash. “It is my fundamental belief that people shop online for three reasons: Selection, pricing and convenience, nothing else. COD basically knocks the last one out of the park,” says Vaitheeswaran. The Indian mobile growth story was to a large extent powered by the rise of the prepaid SIM card, which gave customers greater control over their monthly bills while putting their money in the hands of mobile operators upfront. Taking a cue from mobile operators, Indian Direct to Home (DTH) operators convinced their customers to pay for their monthly TV in advance instead of at the end of a month, as they’d done with local cable operators. But through COD, e-commerce companies are doing exactly the opposite, thus squandering a massive cash flow advantage. Mukesh Bansal, the founder and CEO of Myntra.com, lived in the US for nearly a decade before moving back to India to start his business. “I shopped with Amazon.com for years, using my credit card. But for the last few years I’ve been ordering through COD only. I think it’s India’s equivalent of [Amazon’s] one-click-pay,” he says. Of course, Myntra offers its customers COD, like practically every e-commerce company in India. COD now accounts for 50-60 percent of orders for most companies. “People have gotten so used to COD from other e-commerce sites that it has become an expectation,” says Gaurav Kushwaha, the founder and CEO of online jewellery seller Bluestone.com. Indian e-commerce firms credit COD for enabling millions of Indians to transact online using cash because there simply isn’t enough plastic around. There are 100 million internet users in India, but only around 18 million credit cards. But according to the Internet and Mobile Association of India (IAMAI), of those 100 million internet users, only around 10 million are active online shoppers. And the RBI tells us there are 240 million debit card users in India. We are thus confronted with two stark facts: First, there are over 200 million card users in India who are still not shopping online, and second, e-commerce companies who offer COD might be turning debit or credit card users into exclusive COD users. Of course, one could argue that most of these users aren’t comfortable using their cards online, but IRCTC, the Indian government-owned rail ticket portal, has managed to attract 25 million registered users without offering COD. Much like a slow-acting toxin introduced in a person’s bloodstream, COD makes its presence felt gradually within startups by infecting various functions and creating unforeseen complications. The most obvious “symptoms” are the direct costs. For every order delivered via COD, third party courier companies charge either a fixed fee, ranging from Rs 45-75, or 2.5-3 percent of the order value, whichever is higher. Most entrepreneurs counter that a payment gateway for credit card transactions would charge a similar amount. They were right till last month, when the RBI cut merchant fees for debit card transactions to a maximum of just 1 percent. Also, after deducting their fees, courier companies tend to sit on COD money. To avoid this, most e-commerce companies have started doing their own deliveries. 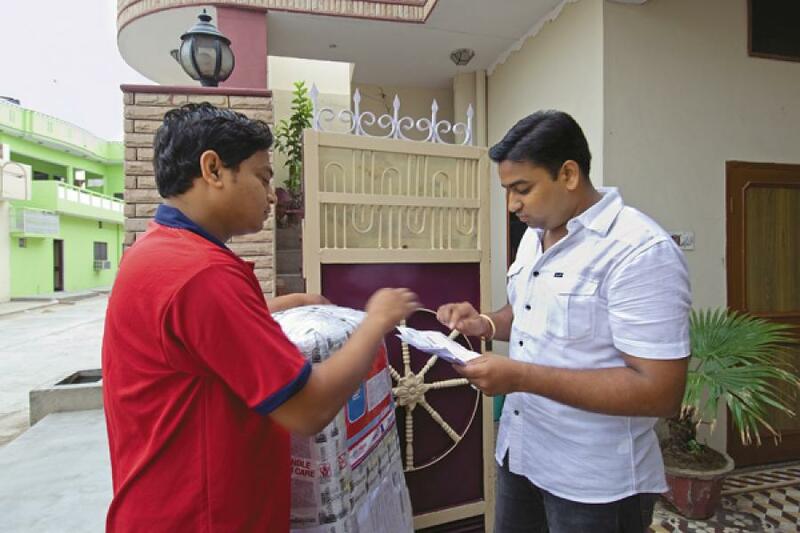 Flipkart alone has about 1,300 employees doing door-to-door customer deliveries. Some of them also carry wireless card readers to allow for “card-on-delivery”, but at an annual rental of Rs 6,000-12,000 per reader, that isn’t an option for every startup. A 2011 study by consulting firm ATKearney in the Chinese e-commerce market found that the economics of running a self-owned delivery network make sense only at a volume of about 2,000 parcels per day per city. In India, where operations costs generally outstrip China’s, the figure might be even higher. Now a large company like Flipkart may be able to afford it, but can others? Besides, India has over 40,000 PIN codes; how many can be covered through a self-owned delivery network? COD insidiously works its effect behind-the-scenes in other ways. Because customers who place COD orders haven’t incurred any cost, they usually turn out to be much more fickle at the time of delivery. At Myntra, returns of COD orders average around 4 percent compared to 1 percent for card-based prepaid orders. For most others, it’s much worse. Each return implies a further outgo of Rs 45-75 to the courier company, meaning a total spend of Rs 90-150 on a phantom order. Worse, these returns can play havoc with the inventory costs as products must be examined and restocked. It stands to reason that few e-commerce startups can afford this over the long run. It’s not just the economics. A CEO of an e-commerce firm points towards larger numbers of suspicious high-value orders, like one his firm recently received for nearly three dozen of the latest Samsung Galaxy smartphones, costing over Rs 30,000 each, from a small town in northern India. The order was never shipped after the buyer refused to pay by cheque or accept delivery in the firm’s offices. The CEO says he suspects money laundering could be a possible reason. Because of the potential for mischief with large cash transactions, the RBI too has stated its ambition to move more customers and businesses towards prepaid cards, including mobile “wallets”. “We have taken millions of people who would have been happy paying through cards and moved them to COD. It is a step back for the long term development of e-commerce,” says Vaitheeswaran. In my opinion, COD is an added advantage for customers. Many times, it happens that Customer order the item(s) online and select COD option. Now e-commerce company hand-over the ordered item(s) to courier. But courier person does not deliver on time or does not deliver or fraud happens. In this scenario, customer is helpless. e-commerce companies takes money in 2 minutes but while returning the money, they have cumbersome and long tiring process. So if customer select COD option then it is responsibility of e-commerce company and courier company to do the job. After-all Customer is the king of market and why should customer play in hands of these companies. I have objection on the other statement said about customer is fickle. All customers are not fickle, only a minor part may be fickle. The people who are educated and understands e-commerce websites well, they only order through them. So these customers select items carefully and know what to buy hence do not change choices every minute. I totally disagree. Go back and do your research again! Without cash on delivery ecommerce would be far behind in india. You wouldnt be talking about it now. I have seen more than 1000 people start buying products online just because there is cod option. And after a success in cod they start using credit card. So you can see that they would not use their credit card if cod did not exist. Since they first had to gain confidence in the online business by using cod then after that they become comfortable to use their credit card. And for sellers its worth it. Exactly! Correct observation my friend and I can attest to this because I am one such individual who started with COD but now regularly pay with card. Without COD, only word of mouth can be used to gain trust in e-commerce retailers but is that always enough? What about new startups? They have no reputation and unless they offer COD, a customer will even pay 10% more money for a product just to get it from a reputable site. The fact that a site is willing to offer COD is itself a huge confidence builder for many online shoppers who may not even avail of that option! COD in India is really not worthful because of the changing mind of Indians with in seconds. I worked with India Ebay and US Ebay selling great stuff in electonics. In America customer once confirmation take the product out of 100 packages 2 to 5 max are returned. In India Mahan Desh mera our of 100 minimum 20% are returns. Customer change mind with in one day, customer out of station next day, customer not found on address given. I dont undersrand how buyer think only one way in India they should think about the pain taken by seller on other side. People think loss is for big gaints ebay snapdeal flipkart but very wrong all the losses are imposed to seller no ecommerce company take loss on the shoulders. I am working with shopclues only on prepaid order and now i see 0 returns and 0 complaints that means people paying prepaid are actual customer in India. Whenever you get Indians and Cash mixed together, you can figure that somewhere there is corruption. I have done business with Indian I T firms in the past and have never got what was paid for. Never on time, good quality or reasonable price. These are the key ingredients to a good service. But all the Indian firms want is your money and to do as little as possible for it. in my view, COD eventually will not be successful. a transaction is a matter of trust. COD basically encourages mischief and ficklemindedness. to attract a potential buyer, one can offer other variables. a good reputation( it breaks v quickly these days thanks to FB), good pricing and good service. a happy buyer is most likely to be with you for a long time. take for example www.indiacod.com, the name says COD but not offering any. but the prices are mouth watering, especially mobile accessories. With all due respect - I do not agree with Mr Vaitheeswaran at all. Irony is that how could Forbes make an statement based on one person\'s perspective who failed. Flipkart is successful with COD, and the sole reason is that they have their own logistics. The COD money is never with any courier company. Flipkart has the vision and have been working towards it, they know they would need their own delivery to be UNO and thats what they are doing. Consumers in India buy online for 3 reasons (as stated above). While COD may not be the reason for an already online shopper, for the 1st time users its the best barrier breakup to introduce people to online shopping. A poorly researched article, which looks only from 1 company\'s POV, not the market reality. Fact - In absence of regulation of e-commerce (No BBB\'s here yet), customers are naturally wary of paying upfront to companies who often mis-represent wares or worse, simply delay/not deliver. I was a regular to Indiaplaza till 2005, when I had a 8 WEEKS delayed delivery of a Rs 7k product, despite 4-5 follow-ups with an inaccessible customer services, who offered me only empty apologies, never a refund of excess interest on money. And all the time, the website continued to display the item as in stock, while I was told the reason for the delay was high demand leading to stock-out at the manufacturer. Since, I have had similar experiences with many e-shops (e**kart, ma**rip, ba**day are a few well known brands which disappointed), which leads me to believe that practices of sitting on customers\' money through unkept promises, not managing supply-chains transparently, not providing correct information on websites even after complaints are not isolated, but widespread. Flipkart is a shining exception. So is IRCTC, which has always refunded me within 5-10 days for years now, without a single follow up ever. Beat that ! The industry would do well to re-look at their strategies. Information, Finance and Goods inter-mediation requires robust ethical processes to be sustainable in the medium run. I think COD are the only way forward as it acts as a guarantee that the products ordered will be delivered and in time. Other wise there are some unscrupulous website that depends on the fact that most customers will not be bothered to sue. So it all depends on the trustworthiness of the company involved ( for eg. i would never buy from Tim***a.com as they have cheated a lot of people) and customers will only want to risk prepaid on reputable companies. With all the hassles from prepaid purchases and anxiety of non delivery and non refund, Its COD or nothing for me. I see forbes for the second time has taken up Flipkart in negative light. I dont see much logic in saying COD nor flipkart are good for industry. is it for homeshop18? Of course CoD is more expensive for the retailers, if the Customer is not paying for the additional option! Did we already not know that? Did those jokers, who are offering these options, not know that? Yes, they did that all the time. Come on - anybody with even 1 foot fore-sight can see that working capital (late recovery) is an issue with CoD - the single largest issue, as it far outstrips the other costs (delivery charges, returns) by an order of magnitude - if not a few! However, why is this complaining and whining by competitors now? Flipkart does it as it can afford to do it now, it has grown the muscle power to do it. So why complain? From the customers' viewpoint too it makes more sense to buy through CoD - as deliveries are made visibly faster by the seller, for better working capital management. So why not switch to CoD from prepaid, where you have to wait longer for the delivery. So I recommend to switch to CoD wherever you can - I have already done it. It is the best way to extract delivery efficiency from the retailer. And not to forget - CoD is the way the retail business mostly works in the offline version. So why should we, as customers, get any less for the online version? Let them bring their efficiency up - why ask for 'special privileges' to 'grow the e-commerce sector', let it evolve on its own merits, overcoming its own weaknesses. Actually Indiaplaza still offers COD on books till today, saying that they have stopped in 2003 is partially incorrect. Crossword\'s online store is a disaster. I ordered a Bible which never came and neither have they refunded the amount I had paid. I got tempted by the lower price and went for Crossword instead of Flipkart. Never again. I\'m one of those debit/credit card holders who refuse to shop with it online, and at the same time have no issues using my card to book railway tickets. The reasons are pretty simple really- with IRCTC, if the transaction does not go through or if you need to cancel the ticket, the refund process is very simple, mainly because there are thousands of people waiting to take that same ticket. Also, it\'s a train ticket- once confirmed the product is guaranteed. On the other hand, if it\'s an e-shop like, say, Indiaplaza, I have absolutely no assurance that the product I order will arrive in the promised time and if it will arrive in good condition. And I have no idea how complicated they would make the refund process if I\'m not satisfied with my purchase. Hence, I\'d prefer CoD. If that option is not available, I\'d rather go to the store to buy the product. In fact, the only reason I started shopping online was because of Flipkart\'s CoD option. Ironically, after several great delivery experiences with Flipkart, I\'d be ready to trust them and to go the online payment route with them. But with the other e-commerce sites I\'ve tried, I would never opt for anything but CoD because of their shoddy delivery times and lack of service. Honestly I feel forbes has taken up a personal vendetta against Flipkart and it clearly reflects in this article. Because they could not have missed writing that flipkart has it's own delivery people they counter that argument by some card-on-delivery...Rubbish. Customers especially middle aged ones are apprehensive about using cards online. They have just gotten around to using ATM's and using cards in shops but online is another game. To get those customers on board, COD is the perfect answer. I have seen people say how can I trust them with a big order of say 30k worth a LCD where they might take my money, if I pay online and never deliver. Lots of people still have that mindset. So companies have to counter it using COD. this model of business should be considered in a broader scenario. the point that COD didn\'t work back in 2003 but has worked now is because of higher internet penetration. secondly, the model was launched to convince the customers that it is safe to shop online. it was a phase, a must have, for e-commerce companies to attract customers. in this report, most of the comparisons are random and do not justify that the model has failed. it would have been better if you would have tried to understand the dynamics involved in indian ecommerce space. it is dynamic and constantly evolving. have read lot of stories about what has not worked or what will hinder the progress or the cloud surrounding future. for a change, plz do some research on the silver lining that has helped the industry to reach this stage. Large players like the homeshop18 and flipkart do not as yet give the best rates. they still charge a hefty premium on every item. In the stateside you can see that there\'s healthy competition in the electronic goods space - amazon, ebay, tigerdirect, newegg, buydig, etc give great prices and are ultra competitive. plus they have sites like reseller ratings which are needed to judge the online stores. we are nowhere close to being a mature market, but I\'m happy there\'s competition out there. I have shopped using both the formats and find CoD the best one. 1) With Flipkart using the card reader, I don\'t have to forego the 1% cash back in my debit card. 2)The biggest advantage is the courier agent has an incentive to find me and get the money - instead of just dumping the package with the building in-charge or reception. Myntra does not have card on reader concept, yet i go with the cash on delivery system with them. 3) My money is not \"locked\" in. When in Rome, do as the Romans do. I see lots of comparisons with Amazon - We need to wake up that this is India and we need to have local solutions/innovations to the same problem. Merely copying their strategy will not work. Kudos to Flipkart for introducing this concept. good points there. what is not said is also that the return rate might be double at 4% or so, but it\'s still 96% profits on the other. they need to adjust the rest as bad debts or other variables affecting the business. they ought to consider a \"restocking\" fees because it does take effort to examine the returned goods. of course if they do advertize that you can return the goods, you better back up your claim. after all the buyers are not at fault for shoddy loss making schemes. COD is just another option of paying.. Unless more and more people start rejecting their orders, companies shouldn\'t have any problem.. COD will not allow to open your parcel and reveiw it. Companies should monitor big orders on COD. As commented by one of viewer it can be from illegal source. In the apparel sector where a lot of skepticism exists among consumers, sites like http://www.myntra.com probably hope to use CoD as a means to acquire customers. The acquisition benefit hopefully overshadows CoD costs in the long run. It is also hoped that once credibility has been established with the consumer, he/she will be more open to paying online vis a vis cod. i feel -as online shopping is not one old and general trend in India, so there is also a good number of genuine customers who buy using COD option suspecting the website for any fraud in delivery or delivery at all. so in a way COD for a new online shopping website assures the customers that there is no fear. once they get assurance they go for credit card way. I totally agree with Mr. Vaitheeswaran\'s view on COD. It erodes our margins. Mr. Vaitheeswaran may be one of the pioneers of ecommerce in India, but got his model wrong, and that's the reason why the company he started is way way behind Flipkart. Bansals, the founders of Flipkart, the native bania's understanding of the Indian buyers. I am a frequent buyer from Flipkart and have ordered items costing from Rs.200 to Rs.20,000, and find the Cash/Card on Delivery very convenient. Needless to say that the high quality of their customer service continues to delight me, ensuring that Flipkart remains the first choice when shopping online. Indiaplaza service is also good. If u compare the prices at Indiaplaza and Flipkart, Indiaplaza offers better pricing. Doomsday sayers like Mahesh Murthy have been predicting the imminent death ("I give them six months", said more than 18 months ago). But Flipkart continues to grow. The fact remains that, as things stand today, the economics just dont make sense. This doesnt mean that ecommerce in India is DOA: far from it. It just means that the the failure rate for ventures in this space will be a lot higher than expected, especially consiering their copycat, \'me-too\' business models. Again, the comment is not specific to Flipkart, but for the ecommerce space in India, in general. COD has rather added convinience I would say. Once I ordered a camera by pre-payment model using my credit card. The camera was not delivered until one month while it was promised to arrive in a week. I simply was helpless. Now in similar case if for reason, I do not get what I had ordered, I will not have my money at stake. At buyer\'s view point, the COD is same as buying from a traditional shop where you get the stuff and then you pay. IRCTC is a bad example to compare as people dont have a choice but to book their tickets using its service for Indian Railways is the only rail service provider. COD isn\'t stopping someone from paying on-line. How is it taking away Convenience then? Maybe Mr. Vaitheeswaran is peeved that someone other than him is getting the COD model right.